If you are looking for a top of the line processor, this is not what you need to buy - but for average needs this is a great processor. It does everything good and I have no complaints about it for the price, this is an awesome value. The FM2 socket will also be getting at least two more generations of processors, so I will be able to re-use my motherboard if I ever want to just upgrade the processor and RAM. This is the high end of the 'Trinity APU' processors made by AMD, which combines both the CPU and GPU on the same chip - allowing you to use solid integrated graphics while not sacrificing too much on either end and saving some money in your wallet. This processor can play almost all games at low/medium settings at 1080p with really no problems, and it the processor can handle almost all general computer tasks. Video playback at 1080p is great too with no lag, I use an HDMI cable to watch movies on my TV as well. If you can get some RAM that is clocked at 1866 instead of the standard 1600, that really helps with the APU (while it usually has no real noticeable effects, it DOES with an APU) and you can see 5-10% gains in gaming. With its stock CPU fan, It was able to run at a stable temperature of 45C @4200, to over clock the CPU further with stability you will be required to buy a more efficient CPU cooling. The maximum CPU clock speed I have achieved with stability was at 5GHz, however my cooling system wasn't able to keep the heat off when the CPU is running at full load, So to run anything above 4600 at a stable speed will require a more powerful cooling system than I do. Playstation Emulators: Runs flawlessly. Great FPS. Diablo 3, Final Fantasy 14, WoW, Final Fantasy 12, Perfect World International, Battlefield 3, Need for Speed Most Wanted: 2012, Guild Wars II, and Sleeping Dogs also run great on it at very playable fps at Medium-High (Mostly High!) Settings. All this on HIGH SETTINGS. Overall: This chip is a good choice for a value gaming/TV PC where you don't plan on upgrading too far past what you have. You can do most games @ 1080p with some @720p with good results. And if you want more GPU power you can drop in a ~$70 card and get improved results (especially since AMD is about 1 month away from fixing their Crossfire issues). 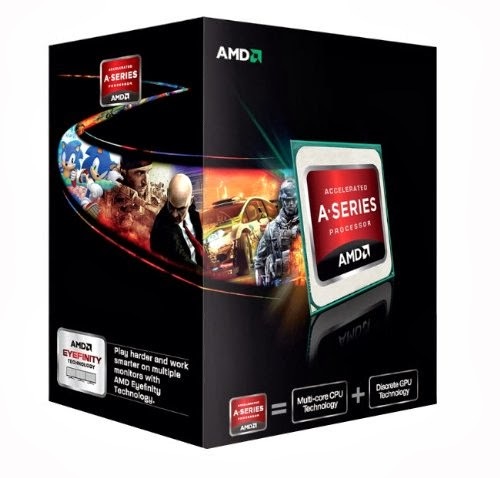 Plus if you're NOT using this for gaming, you'll still get plenty of value for the price, although you may want to consider the A8-5600k for cheaper.